Friday Giveaway with Ball + Chain! Happy Friday everyone! You know what Friday means?? Besides that I get to sleep in tomorrow ;)...lol. ...its another giveaway! This giveaway is coming from our dear friends over at Ball + Chain! Ball + Chain sells the latest fashions and trends in jewelry and accessories. It's a business brewed by best-friends who offer frugal fashionistas style at a price they can afford...because it is a price they choose to pay! What girl doesn't like jewelry?? I know we've already discussed my obsession over the past few weeks :) lol. Every Tuesday Ball + Chain hosts a NAME YOUR PRICE auction at 8pm CST. During each auction fans bid on items up for sale. If Ball and Chain can meet their proposed price, they "win"! They also offer FREE SHIPPING on all sales. Even better!! Ball + Chain's facebook page is https://www.facebook.com/shopballandchain/info. Check out their "How to Bid" tab that offers further information on the bidding process. Even though you can...and should...go bid crazy....you don't have to today! 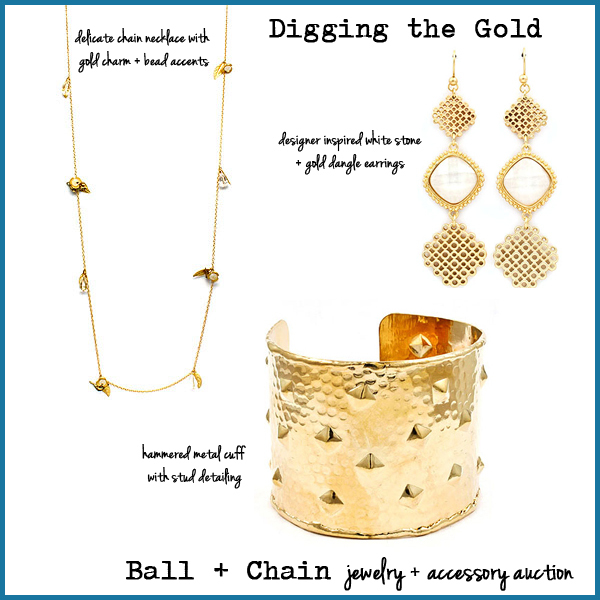 Ball and Chain is offering one lucky TandC reader their own set of jewelry! How beautiful are these pieces??? Remember to leave a comment for each extra entry to increase your chances of winning! Also, PLEASE give me a way to contact you! Giveaway Ends Monday, June 18, 2012 at Midnight MST! I love giveaways! I'm always so SURE I'm going to win. YAY! Here's my comment! Beautiful jewelry! Love it! Super cute stuff. I love that metal cuff! I follow you via Google. I follow T&C and love it! I like T&C on FB! I like Ball and Chain on FB! Love those pieces.. so glad I follow you! I follow you T&C on bloglovin! What a great giveaway! Such pretty pieces! I am a follower of t&c. I love the 3 beauties... pick me!! Love T&C, Love Gold Jewelry and Creative, Cheap and Chic Decor! I'm a follower via email. Enjoy your blog...the jewelry is gorgeous! I follow Thrifty & Chic on Facebook. I subscribe via rss/Google reader! I already personally liked you on Facebook, but my business just liked you as well. I subscribe and I'm excited about this jewelry. Oooh, I love that cuff bracelet!! Lovely jewelry. Merci for the contest. I liked you on FB as "Lika Deala"
I liked Ball and Chain and gave a T&C hello as "Lika Deala"
I'm a follower of Thrifty and Chic. I Like Thrifty and Chic on Facebook. I Like Ball+Chain on Facebook. I Liked Thrifty and Chic on Facebook. I Liked Ball+Chain on Facebook. I am a follower of Thrifty and Chic. I like Ball and Chain on Facebook. Wow! I love a good giveaway! And truly love TandC! Your projects are easy to follow and actually look doable! And they actually are thrifty! Some "thrifty" blogs and websites say they are but then they give you a laundry list of supplies to purchase! I love that you upcycle so many things!